These lightweight easy to use wraps are a convenient cold/hot wrap for the relief of symptoms associated with muscle and joint pain. The specific design of each individual wrap moulds to the exact body part incorporating all facets of injury cold/hot treatment with attached Velcro straps for easy fastening. 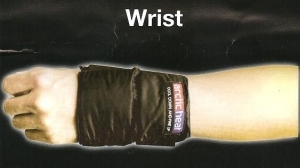 These wraps can be worn under clothing during normal activity. So now you can treat those injury symptoms without wet messy packs and not having to interrupt your normal routine. Based on the same technology as the revolutionary Arctic Heat Body Cooling Vest.